Romanian legend has it that the city of Bucharest was founded by a shepherd named "Bucur", whose name means "joy". His flute playing reportedly dazzled the locals and his hearty wine from nearby vineyards endeared him to the local traders, who gave his name to the place. 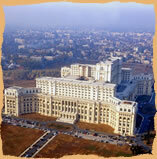 Due to the city's elegant architecture Bucharest was once known as the "Paris of the East" or "Little Paris". Most of the city's medieval architecture that survived into modern times was destroyed by the communists and replaced with high communist apartment blocks. Still, some historical precincts remain, most of them in Lipscani area. This precinct contains buildings such as Manuc's Inn and the ruins of the Curtea Veche (the Old Court of the King), and during the Middle Ages was the heart of Bucharest's commercial world. Bucharest is renowned for the Arch of Triumph, The Parliament House and the Village Museum.